Shenzhen, China retrofits financial zone with a revitalizing green "boulevard in the sky"
When the global design company Hassell won the competition to design a one-mile green “high Line”-style corridor through Qianhai, a financial district in Shenzhen, China, they were offered the unique opportunity to fundamentally guide the redevelopment the city. Although the area they were operating in was newly-developed, the original plan did a poor job of connecting the area, and wasn’t especially pedestrian-friendly or green. Those qualities are now being retrofitted into the neighborhood via a High Line Park-inspired green walkway. Shenzhen’s Silk Road Corridor (formerly called the Qianhai Mawan Mile) uses a winding skydeck to tie together new cultural buildings and lush parklands in one essential urban destination. Spanning some 15 square kilometers (5.8 square miles) of recently-reclaimed land on the western edge of the city where the Pearl River meets the South China Sea, Qianhai is destined to become a more-liveable cluster of high-end offices, hotels, apartments and civic institutions when its development is completed around 2020. 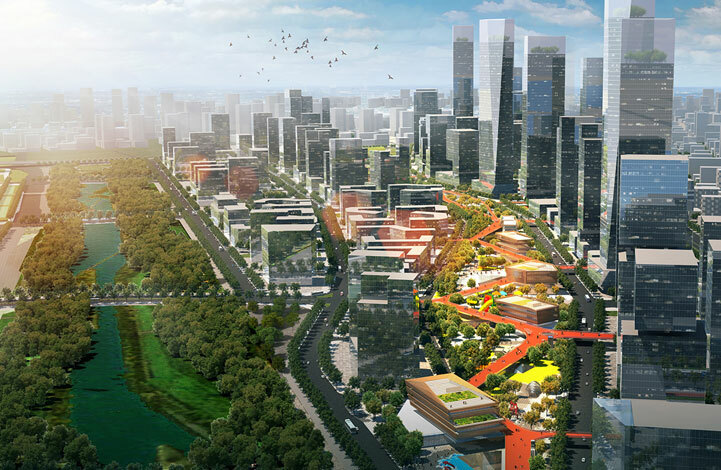 HASSELL has been appointed as design partner for the development of a critical, mixed-use precinct within the new Qianhai business district of Shenzhen, one of China’s vital ‘gateway’ cities. 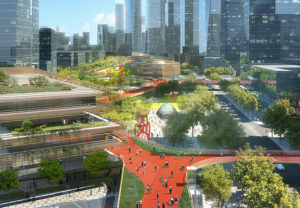 This project is designed to engage people – particularly the young, mobile residents of this fast-changing area – and promote better health and social connections. 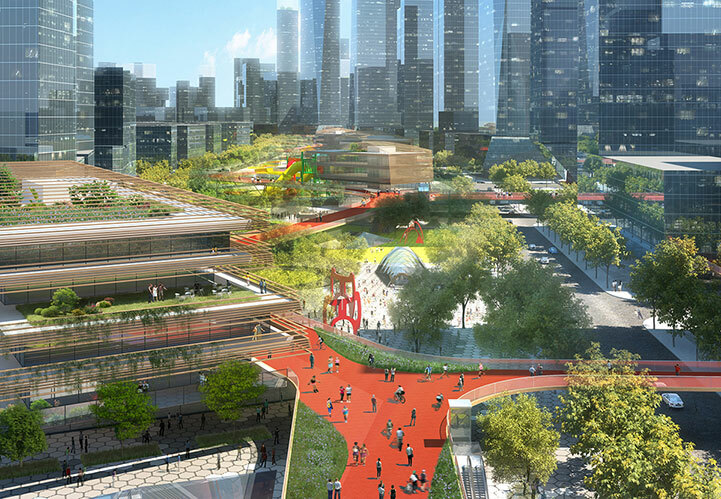 The masterplan consists of four integrated layers: above and below ground neighborhood zones, a continuous park, a series of pavilion buildings and a skydeck weaving through it all. 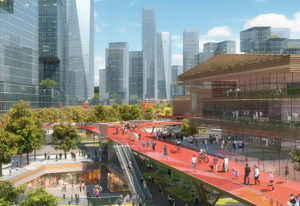 This 1.6km-long skydeck connects the precinct’s buildings and park with surrounding buildings and the wider network of city streets. It’s also an uninterrupted cycling and jogging path that supports exercise and well-being. There will be a waterfall that spills down from the platform into a ground-level park. “The bridge acts as a viewing platform for people to enjoy the water feature and where people can enjoy special events,” Ho says. Different activity zones on the ground will be distinguished by color-coded paving materials. “The ground level has these giant hexagonal tiles in different colours, kind of like a pixelated map,” he continued. In the neighborhood zones, landscape infrastructure encourages people to slow down and relax – and catch up with friends and family. There are gardens for quiet reflection, wet and dry play spaces for kids, group exercise areas, piazzas with cafes, and open venues for outdoor events and art installations. A major entertainment precinct located below ground connects to multiple metro concourses, and sunken plazas feature semi-outdoor dining areas and market places. At the southern end of the development there’s a new cultural district punctuated by three pavilion buildings. 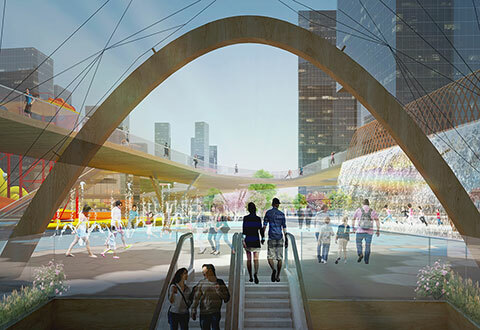 Each responds to its unique site and purpose while still expressing a common architectural language that’s in sync with this distinctive, fully integrated urban destination. All renderings courtesy of HASSELL.